Park Forest, IL–(ENEWSPF)–Editor’s Note: We continue our reporting on news from police reports. Besides covering the many stories from around Park Forest that otherwise might go unnoticed, we want to bring more complete coverage of police reports than is reported by other local media. An arrest does not mean that a person is guilty. All those arrested are presumed innocent until proven guilty. It is the policy of eNews Park Forest to not remove items in the public record from publication. If your name is listed in the police reports, we will only add information relevant to the final disposition of the case at hand, e.g. "Mr. Smith was subsequently acquitted," "Mr. Smith entered a guilty plea," or "All charges against Mr. Smith were subsequently dropped." We will do so upon receiving and verifying proof of such disposition. Persons wishing to leave anonymous information on any criminal matters including narcotics or gang activity are encouraged to call 708-748-1309 and leave a message on Detective Beilke’s voice mail. A juvenile was arrested on December 27 and processed on a charge of domestic battery when police were dispatched to the 200 block of Early Street to investigate a report of domestic battery. A Smith & Wesson .357 revolver, a 9 mm Glock, a .25 caliber Ruger auto, a .45 caliber Glock, a .45 caliber Highpoint auto, a 9 mm Highpoint auto, a 7.26 World War II Barretta, a 9 mm Polish Nazi Officer Auto, a .22 caliber rifle, a 12-gauge shotgun with a pistol grip, a .45 caliber Thompson Carbine, thousands of rounds of a variety of ammunition, gun holsters, gun clips, $100 in loose cash, and several bottles of liquor and wine were reported stolen from a residence in the first block of Thorn Creek Drive On December 27. Sherrod A. Booker, 23, 4198 Charleston Rd., Matteson, was arrested on December 29 and charged with misdemeanor possession of cannabis and issued a traffic citation charging driving without lights when required when an officer on patrol observed the vehicle Booker was driving southbound on Western Avenue with no front headlights, according to police. The officer conducted a traffic stop at Western Avenue and Chestnut Street, according to police. The rear driver’s side tire of a vehicle parked in the first block of Ash Street was reported slashed on December 29. Police were dispatched to the 300 block of Blackhawk Drive to investigate a complaint of deceptive practices. A resident reported that there had been unauthorized activity on his checking account. Police continue to investigate. Augusta Y. Wideman, 47, 1424 W. 115th St., Chicago, was arrested on December 29 and charged with domestic battery and criminal damage to property when police were dispatched to the 300 block of Oakwood Street to investigate a report of a disturbance coming from inside a residence. Both tires on the driver’s side of a vehicle parked in the 100 block of Blackhawk Drive were reported slashed on December 30. 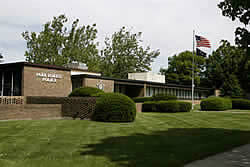 Police were dispatched to the Park Forest Fire Department on December 30 to investigate a report of battery. A resident went to the Fire Department to make a complaint of battery. Police continue to investigate. A vehicle reported stolen from the 300 block of Sheridan Street on December 30 was found illegally parked in the 200 block of Lee Street on December 31. Two ruby earrings, valued at $200, a blue diamond engagement ring, valued at $2500, a blue diamond wedding ring, valued at $2500, and two gold earrings, valued at $100 were reported stolen from a residence in the 300 block of Oswego Street on December 31. Police have suspect information and continue to investigate. The living room window of a residence in the first block of McCarthy Road was reported shattered by a BB gun on December 31. The resident reported that she was sitting on her living room couch when she heard a "pop" sound coming from the living room window. She checked the window and observed a hole in the double-pane window.